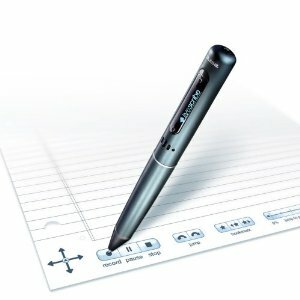 A Livescribe Pen is a pen with a built-in microphone, thus enabling you to record audio while writing notes or drawing. To play back your notes you can tap on the relevant note in the Livescribe notebook. You can also view and play back your notes through Livescribe Desktop software, which also enables you to search your notes and convert handwriting to editable text using ‘Myscript’ software (sold separately). There are several models of Livescribe Pen; we recommend the Echo with 3D recording headphones connected for distance recording in lecture theatres. Click here to find out how a smartpen could help you.